Looking out over the sparkling waters of the Persian Gulf, stands the shimmering skyscraper that is the Ramada Abu Dhabi Corniche. Located in an exciting modern quarter of Abu Dhabi, this hotel boasts an onsite pool, spa, gym and restaurant, making it the perfect place for you to spend your holiday. See the glittering capital of the United Arab Emirates for yourself where you have everything from business to the beach. The Ramada Abu Dhabi Corniche is just outside the centre of Abu Dhabi with several restaurants and shops within the immediate proximity. 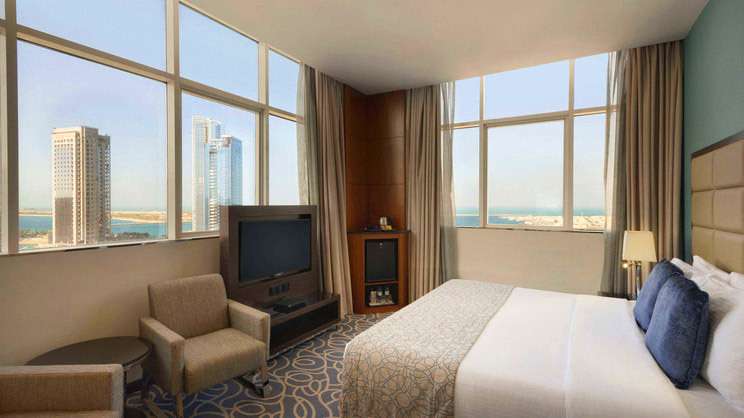 The Ramada Abu Dhabi Corniche is approximately 36km away from Abu Dhabi Airport.